Files can be created and saved. 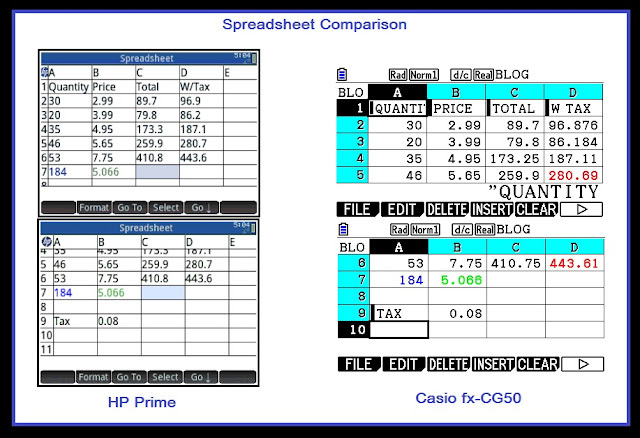 The fx-CG50 stores spreadsheets as separate files. [ALPHA], [ *10^ ] (“). Text cells are indicated by a solid black strip on the left side of the cell. During formula entry: [ F5 ] (CELL), [ F5 ] (Sum). The function is named CellSum. During formula entry: [ F5 ] (CELL), [ F3 ] (Mean). The function is named CellMean. During formula entry: [ F5 ] (CELL), [ F4 ] (CellIf). Do you use the spreadsheet mode on your calculator? Check it out if you have not done so. Happy First Days of Summer (Northern Hemisphere)/Winter (Southern Hemisphere)! then Cell A1 is red if it contains a negative number and yellow if it contains a positive number or zero. It says scatter plot is not possible on the prime, but don't you only have to copy the data to the advanced plot app and do it there?